We designed this sweet bridal shower invitation for a bride on the sunny West Coast. We love printing in bright and happy colors, especially neon pink. 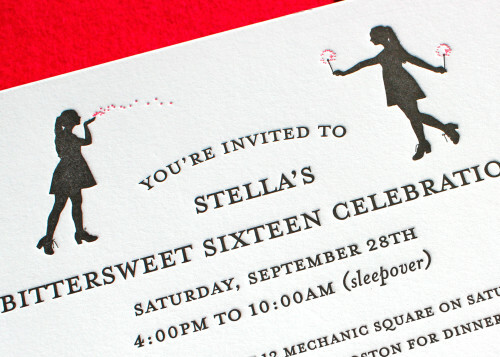 A bright pink invitation like this sets the mood for a really fun shower. And doesn't that calla lily look feminine and beautiful? We designed and printed these Save the Dates for a birthday party at the American Museum of Natural History, here in NYC. The design was inspired by vintage circus posters, complete with a banner carrying elephant. 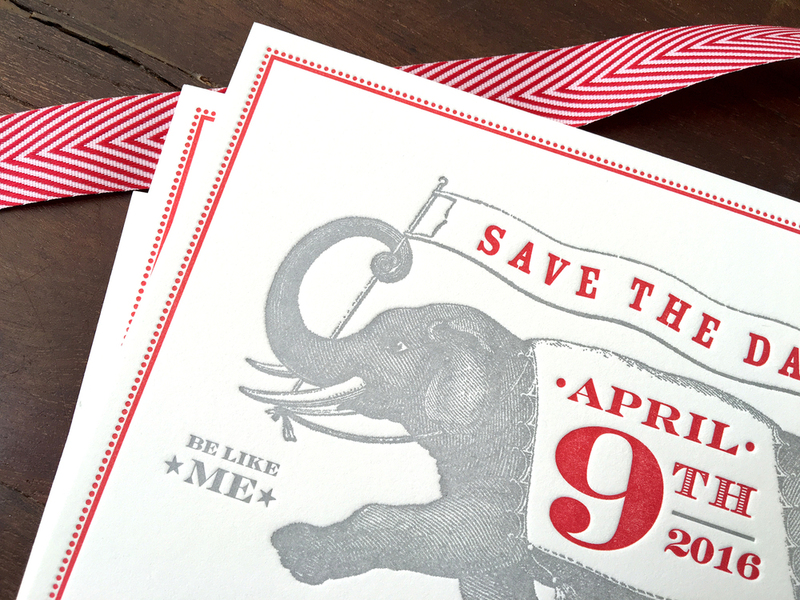 The elephant was letterpress printed in silver, and has a bit of shine that plays well with the bright red of the text. We can just imagine how fun a night at the museum would be - hopefully without any dinosaurs or elephants springing to life. Doesn't a nightcap at a rowing club sound like a fun time? The vintage illustration of crossed oars, printed in forest green give this design a classic look. We just love the simplicity and warmth of this letterpress card. Over the last dozen years, we've been lucky to collaborate with really cool people involved in interesting projects. I love meeting other entrepreneurs and getting to learn about their creative ventures. We often work with people as they are launching their businesses and then get to collaborate over and over as their business grows and evolves. One of our favorite collaborations these days is with Jenny Capano and Tara Gilson of The Sporting Project, a new creative agency based in Paris. With roots in NYC and a love of Paris, they are bringing the two cities' lively cultures together through exclusive events, exhibitions and consultancy. 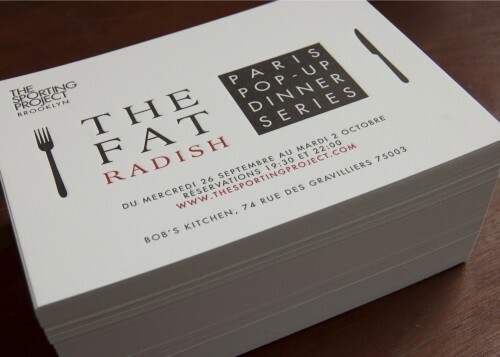 This month they are hosting a "Pop-Up Dinner" and bringing New York's, The Fat Radish, to the Marais. We wish we could attend! For more information, check out the nice press they have gotten through Go Go Paris and check out the sweet letterpress invitation.